Skip the sauerkraut and try adding some Paisley Farm pickled Brussels sprouts in this delicious dip. Hot Reuben and Sprouts Dip is creamy, full of flavor, and comes together easily. Your family will ask for it every holiday! This post is sponsored by Paisley Farm but all opinions are mine. What is it about New Year’s that screams appetizers? It’s like New Year’s and the Oscars all require large quantities of small foods to eat. Of course, I’m really not a good judge of these things. I haven’t been out for a New Year’s Eve in the better part of twenty years. Yes, I said TWENTY! I’m not a party animal. Wow. That’s an understatement. My idea of a good party is me, the dogs, and the hubs on the couch with some nibbles, some movies, and maybe a Scotch on the rocks. It does not involve the general public who cannot contain themselves when they’re drunk. Or those that turn their noses up at others who don’t look like them. I distinctly remember a Halloween party out where I was constantly pushed by this one woman on the dance floor. Like, WT…? I know. This isn’t the best way to start a blog post. But, I’m painting a picture of why I’m not a huge fan of going out for holidays like New Year’s Eve. We prefer to stay in and have a quite evening alone. Now, sometimes I glam up our nibbles and make these blue cheese, fig, and caramelized onion palmiers. They look fancy, but they’re super easy and delicious to make. I’m not kidding. The hardest part is the caramelized onions. Sometimes I serve up some deviled ham bites or deviled eggs to nibble on. Other times, I stick to appetizers that are comforting and delicious to me like hot pepper jelly with cream cheese and crackers. It’s a different appetizer that most haven’t tried. It’s always fun introducing them to something my family loves. That’s why I keep a jar of pepper jelly in the pantry. I also keep a few jars of Paisley Farm pickled vegetables in my pantry. Their cauliflower is addictive! Sometimes, I chop it up and use it in place of sweet pickle relish. The color is so fun and that extra crunch is delicious. Their pickled beets are perfect in salads or on a great charcuterie board! And then there’s the dilled Brussels sprouts! I couldn’t stop eating them. However, I had to stop because I needed at least a cup or two to make this delicious dip. The Brussels sprouts combined with the great dill flavor makes them popable. You know what I mean, right? Totally popable into your mouth? And they have a spicy version if you’d prefer to kick things up. I haven’t cracked into those yet, but they’re on the list to bust out for our New Year’s celebration. There were so many ideas in my head about how to use these delicious little sprouts. Ideas like dilled deviled eggs, oven fried dilled sprouts, and using them to stuff chicken went through my head. But then I went the route of a creamy, hot dip. But what kind of dip? Maybe a dill pickle dip! Nah. Too boring. Not that I wouldn’t devour a dill pickle dip, but I wanted to step it up. I wanted something different that would truly highlight the Paisley Farm sprouts as something unique and different in a recipe. Creamy dip creamy dip creamy dip….what kind of creamy dip? Then I remember a Reuben dip I had seen and was planning on making. Because, you know I love everything with corned beef on it. Perfect! The question was, do I just add the sprouts to the other typical ingredients? That might be a little too much tart to go with the creamy goodness. Why not skip the sauerkraut all together and put the dilled Brussels sprouts in its place? They’re not as tart as sauerkraut which I think would be a good thing. The sprouts would add a dill flavor which would be fun. It would be like combining the pickle dip with the Rueben dip! I know, I’m a genius! You have to say it. Just look at all that creamy deliciousness!! You can see the chunks of corned beef, that glaze of Swiss cheese on top, and flecks of the green Paisley Farm Brussels sprouts throughout. It’s chock full of chunkiness so every cracker scoop full will have plenty of corned beef and sprouts along with the Thousand Island dressing flavor. For those of you that might be concerned, no, there’s not a HUGE amount Thousand Island dressing in there. There’s just enough to get a taste of it at the back end. Meaning, you get that little hint of flavor at the end of your bite. You’re chewing and chewing and chewing and then bam! There it is. And then you say, “Oh yeah! This is a Reuben dip. It does have Thousand Island dressing in there! I made this when I was home alone. Don’t do that. You have no one to stop you from eating the whole pan yourself. Thankfully, the dogs stopped me. So, I put the rest in the fridge to nibble on later. And you know what? After it’s cooked, you could totally chill it and serve it at room temperature with a knife to spread the dip on crackers. I know this because I did this. It tastes pretty much to same without the gooey, melted cheese goodness. I bet you could turn this into a Reuben and sprouts cheese ball! Oh wouldn’t that be delicious?? You could coat the outside in some toasted pumpernickel bread crumbs. That sounds so good! I might have to try that. I’ll let you know how it turns out. I pulled out one of my cast iron skillets, but you could easily bake this up in a small casserole dish. It makes about 3 cups of dip so you can judge what size casserole to use. However, you could divide this out into a few souffle or other smaller dishes and add it to a charcuterie board! I’m rolling with the ideas today! A bit of hot dip on a charcuterie board would totally kick one of those up for the holiday. I can’t wait to set out the cauliflower, beets, and hot dilled Brussels sprouts for nibbles New Year’s. They’re a step up from my typical green and black olives, gherkins, and baby dills. I did get some shrimp, too, this year. I am trying to kick up my nibbles game. It’s my goal to have a tapas dinner some day. I just have to get the hubs on board with that. I hope you try the Paisley Farm dilled Brussels sprouts. They gained popularity as a drink garnish but they are great right out of the jar along with all of other vegetables. Make to follow them on Facebook, Instagram, Twitter, and Pinterest to get more ideas on how to serve up these delicious vegetables, salads, and salsas. Skip the sauerkraut and try adding some pickled Brussels sprouts in this delicious dip. This Hot Reuben and Sprouts Dip is creamy, full of flavor, and comes together easily. Your family will ask for it every holiday! 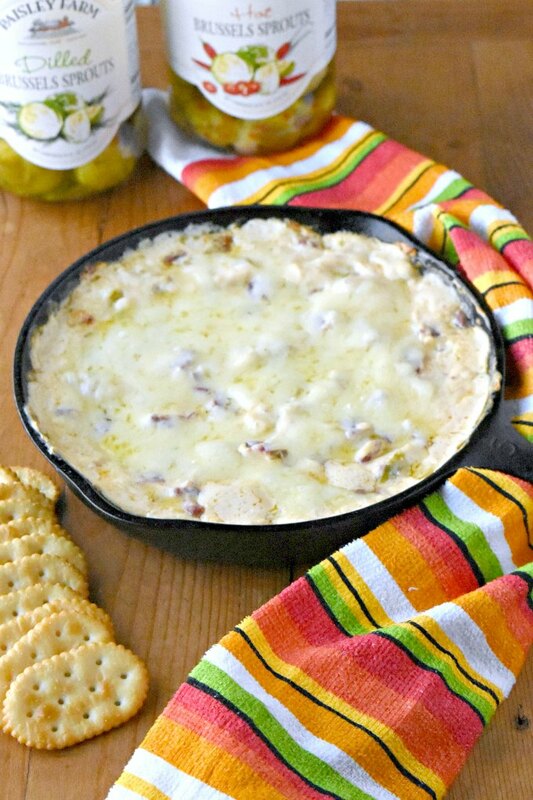 What a decadent cheesy dip! I love that you used the dilled sprouts in here. Such a tasty idea! Their flavor is decidedly different. So so good. Interesting. I’ve never seen reubens done with Brussies. I love Brussels Sprouts and I love sauerkraut so this screams, “Eat me.” Yessssss…. Wow ! This dip looks like a winner. I love the idea of the Brussels sprouts in place of cole slaw! Thank you! They’re deliciously different. Hahaha. If it was up to me we’d celebrate with London. So much flavor! I bet the Thousand Island really gives this a good tang that is perfect with the creaminess of sour cream, mayo and cream cheese. Sound delicious! Thank you! It really does add that extra flavor that rounds out the dip.